Landscape architects, especially when leading a multidisciplinary team, bring a keen understanding of the balance needed between natural processes and human activity. Advocating that the preservation of wild salmon is directly linked with preserving related ecosystems, the Pacific Northwest Salmon Center is a unique facility for education, interpretation, and scientific research about wild salmon and the species’ importance to the Puget Sound ecosystem. South Hood Canal, where the site is located, is suffering from low oxygen content which threatens wild salmon populations, a serious issue which the Center is dedicated to combating. 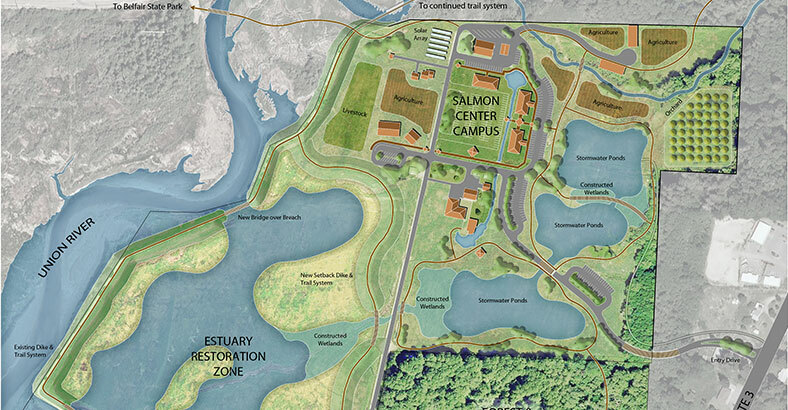 This project provides the public with a facility that showcases how human activity is vital to supporting and sustaining healthy salmon habitat. It is supported by a diverse group of partners including the Hood Canal Salmon Enhancement Group, Washington Department of Fish and Wildlife (WDFW), National Fish and Wildlife Foundation, Washington Department of Transportation, Evergreen State College, Boy’s and Girl’s Club, Olympic College, North Mason School District, and members of the Belfair community. The 90 acre site situated at the head of the Hood Canal along the Univion River was diked in the 1890s to create farm land. The Center’s master planning, led by landscape architects, began with data collection and analysis that included hydrological modeling based upon historical high tide elevations dating back to the 1800’s. This information helped determine the original pre-dike boundaries of the salt marsh as well as anticipated high water elevations and height requirements for a new setback dike to protect the Center from flooding. Groundwater data was also examined to determine the feasibility of various wastewater and stormwater treatment options, and stormwater treatment of the nearby state highway became a key element in the final plan. Research and Education Facilities and Programs: Scientific and research facilities will include a water testing laboratory to coordinate the Hood Canal Dissolved Oxygen Study, a demonstration salmon stream to educate the public on the life cycle of Wild Salmon, university-based environmental education and research programs, and community-based environment outreach programs for educating youth. Estuary Restoration: Using hydrological modeling based upon historical high tide elevations dating back to the 1800’s, the existing diked hayfields will be returned to their original salt marsh condition by selectively breaching the perimeter dike, which is also topped by a popular walking trail. 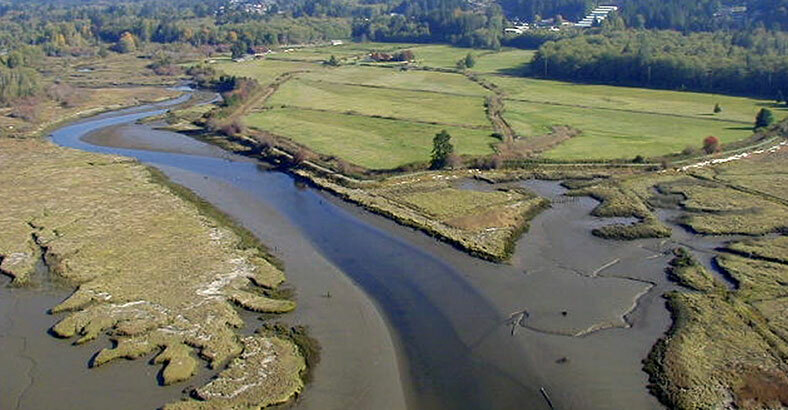 The salt marsh will provide critical habitat for young Salmonid parrs. Adaptive Reuse/Sustainable Architecture: In its initial phase, the Center will adapt existing on-site buildings for its programmatic needs. The existing Johnson residence and garage will be converted to administrative office and research space. 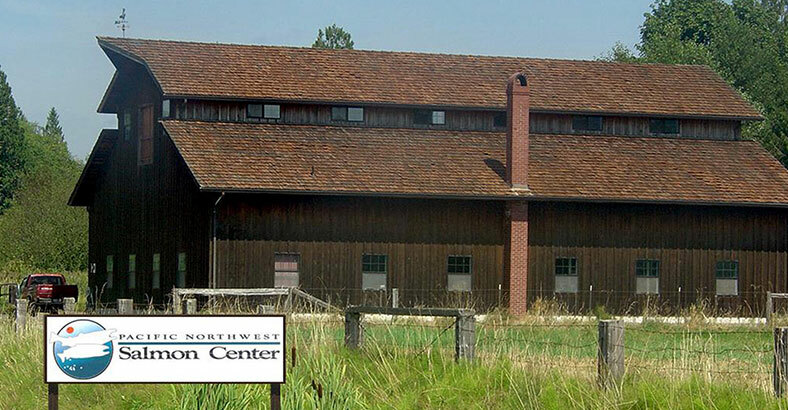 The existing barn will be preserved and used as multi-purpose space and student housing. Three sheds throughout the site will serve as interpretive nodes along the trail system. Other buildings incorporating sustainable architectural design principles will be added as programs grow and funding becomes available. Sustainable Energy Source: The Center seeks to be 100% sustainable through the use of solar power (electric and hot water) and geothermal heating and cooling. On-site buildings will be fitted with rooftop solar panels supplemented by ground mounted solar arrays. Heating and cooling will be by geothermal heat pump systems, one of the cleanest, most energy-efficient, and cost-effective systems available. Sustainable Wastewater Treatment: Part of the “hands-on” environmental learning experience will be the natural treatment of on-site wastewater. Hood Canal water quality has been adversely impacted by numerous septic systems along its shores in the absence of a municipal wastewater treatment facility. The Center will counter this problem by focusing research efforts on new treatment strategies for its own wastewater. Initially the treated water will be reused for irrigation, but future research at the Center will lead to more options for the recycled water. Sustainable Agricultural Practices: A portion of the existing hay fields will be used to demonstrate sustainable agricultural practices. Recreation: A barrier-free interpretive trail system will meander through the site. The trail system will be linked to the neighboring Community of Belfair and the adjacent Belfair State Park. The site will be accessible by automobile, walking and bicycle trails, and water craft. Natural Stormwater Treatment: Through a joint-venture with the Washington State Department of Transportation, stormwater runoff from approximately 10 square miles of urban development in the Belfair Urban Growth Area will be channeled and treated through a series of wetland ponds on-site before being returned to the Union River. Site generated runoff will be limited through the use of permeable materials for roads, pathways, trails, and parking areas where feasible. 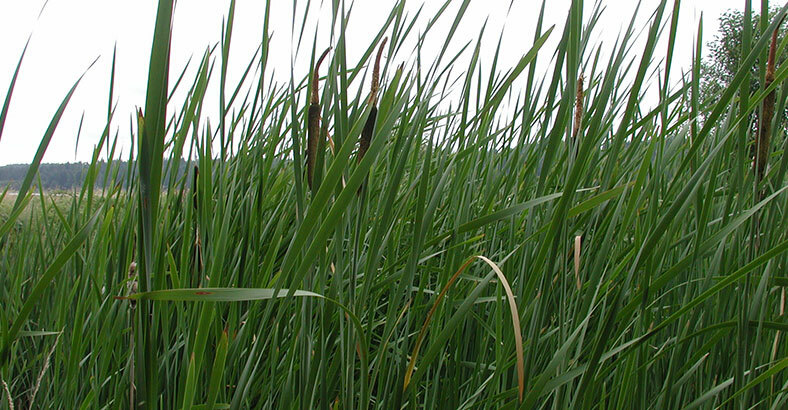 The wetland ponds will also provide wildlife habitat, recreational value, and standards for water quality research. The social focus of the Center’s regional target audience, defined as within a two-hour drive of Belfair, includes school groups, families with children, day trippers and state park visitors. A supporting business feasibility study collected and analyzed population demographic data for a six-county region falling within this drive time, including age, education level, income level, and mean travel times. This data was used to help project whether or not the population could support a facility such as the Salmon Center and what types of programs would be most appropriate. Attendance data for state parks in close proximity to the Center were also analyzed to gauge potential interest from park users and identify collaborative opportunities for programs that could supplement activities available at the parks. School districts and student populations within 100 miles of Belfair were identified to gauge potential level of use by school groups.